PKN Controls is a Hungarian company located in Szekesfehervar. Founded by Peter Papp, Roland Nagy and Gergely Kiss in 2001 to design and manufacture high quality and high power amplifiers for live concerts, theatres, clubs and stadiums, they use exclusive lightweight high current technology from their background in industrial power control. The evolution of their product line has been remarkable since the introduction of the first XD Series (XD-1600, XD-2500,XD-3200) in 2001. Their winning combination of high output, extreme portability and industrial levels of build quality giving more than the reliability needed for tour grade applications found these amplifiers a strong customer base across Central Europe. Expanding on this success, PKN developed the XD and XE Series, introducing them to the world at the SIB2006 exhibition (Rimini, Italy) in 2006. Since then they began establishing distribution channels across the global marketplace. PKN continually listen to feedback from customers and distributors worldwide, and always place these requests at the heart of their research and development process. Some of their developments include the truly astonishing 3PHASE Series which can deliver up to 40000W (yes, that’s forty thousand Watts) – of power output from a single rack unit weighing in at under 14kg. With the option of 4 outputs at 10000W or 2 outputs at 20000W, the challenge is going to be finding speakers man enough to handle the power. 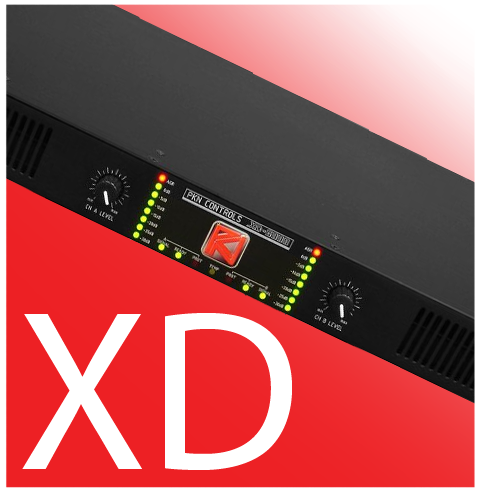 The XD Series offers an extremely affordable and portable solution for high power amplifier requirements. The XD2500, XD4000 and XD6000 weigh in at 8kgs, 9kgs and 9.5kgs respectively, making it possible to rack up seemingly limitless power effortlessly. No more giant back-breaking racks to hump around; with PKN, you can easily run a 20kW system with just a few amps in a small rack that’s a one man lift. 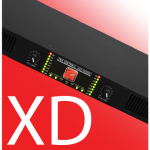 The XD Series includes comprehensive protection circuitry; covering Short Circuit, Overload, Low Impedance, Thermal and DC Fault conditions. The XE Series offers additional features for the more demanding user, all models in the series have LCD graphic display units and two rotary jog controls for direct control of the system parameters. Particularly useful for larger, more complex installations, the devices have internal webserver software which facilitates remote operation via normal internet browser (JAVA based) or with dedicated PKNC control software. Simply connect via standard ethernet and you can remotely monitor the amplifiers status and adjust limiters and volumes. To meet the increasing user demand for extreme power in sub-bass applications, PKN Audio developed two new models in 2013, available as part of the Universal Line Touring Amplifier Range , the XD10000U and XE10000U are welcome additions to the range, offering power output up to 6,500W per channel. Both feature excellent dynamic response, improved damping factor, and new digital controlled high-frequency single-stage resonant power supply with high power factor operation. As part of the Universal Line, they have exceptional AC line range and ruggedness against line disturbances. Operating range is from 64Vac to 300Vac with inbuilt protection against accidental connection of up to 560Vac. Power control is paramount in all XE Series amplifiers, with Zero inrush current, programmable wake-up sequence(s) and mains current limiter help to operate systems on limited resources. 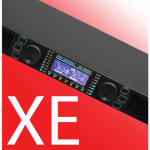 The new XE Series firmware also includes a digital limiter which can be programmed in Watts to help protect your speakers against excessive power. So how do they pack so much power handling into such a small amplifier? Turns out it’s just some clever technology, secret custom built high quality components, and a little Hungarian magic. Arriving in the UK In January 2014, we are looking forward to road testing these pint-sized power stations.